This product is perfect for hunting, training, self-defense, or just having a good time at the range. It is economical, reliable, and effective. 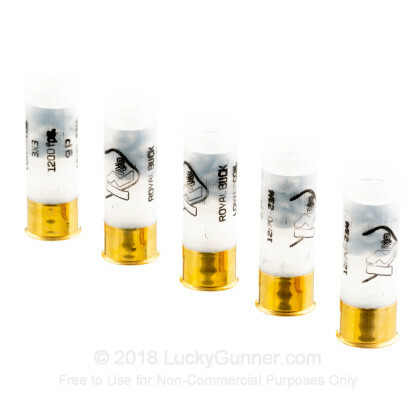 Low recoil shells help reduce shooter fatigue helping you to enjoy your time at the range with less ache. Rio Ammunition is manufactured in Spain and has become more and more widely available in the U.S. market in recent months and years. 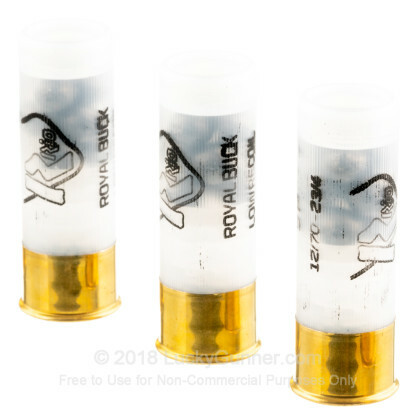 Not many people have heard of Rio Royal Ammo. Considering that they make over half a billion shot shells a year, that may be a little surprising. However, they are just starting to seriously market their products in the US. Rio ammunition is manufactured in northern Spain. They're somewhat different than other ammunition manufacturers, especially in Europe, in that they make every component of their ammo from the explosive used in the primers to the gun powder, to the hulls. This kind of vertical integration allows the company to have total control of the quality of everything they put their name on. That's the sort of quality you want if you're buying ammo for home defense. 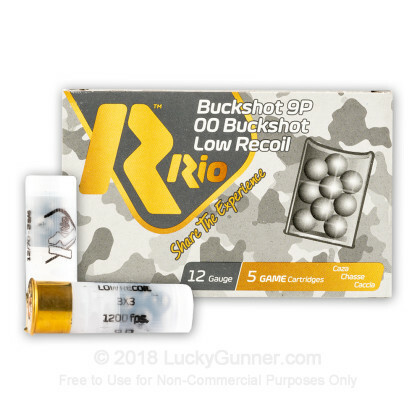 And while Rio ammo proved to be perfectly reliable in all the firearms I tested it in, it's also priced low enough that you can buy a lot more ammo for the same amount of money as the competition. That means more training, which leads to more proficiency. And again, if you're talking about home defense, becoming and staying proficient are really important. I tested several different types of Rio ammo. For this review, I'll cover their 12 gauge, 2 and 3/4 inch, low recoil 00 buckshot. There are a few basic ways to reduce recoil with shotgun ammo, and they involve either reducing the number of pellets or reducing their velocity, or both. 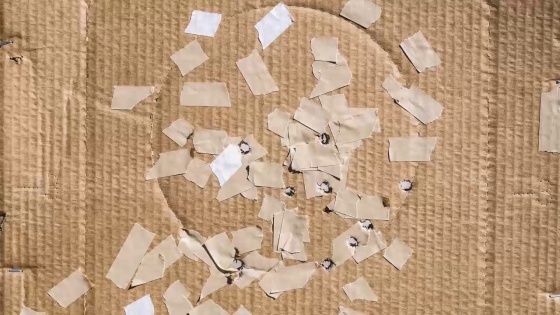 Rio chose to reduce their velocity to 1,200 feet per second from 1,345 for their standard load, but left the number of pellets the same at nine. At nine yards from a cylinder-bore shotgun, the pattern was about the size of a hand with fingers spread. At 15 yards, the pellets at the extreme edges of the pattern were all over the chest area. And beyond that, one or more pellets missed the target. So this ammo is best used indoors or at very close range outdoors. 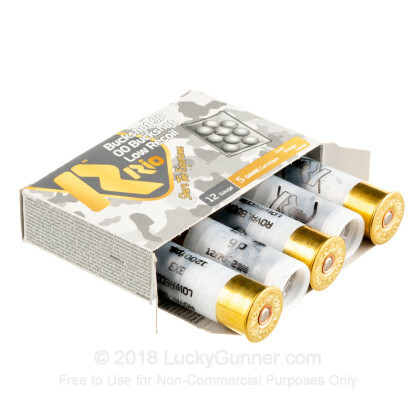 It can also serve as a reliable and affordable buckshot training ammo if you want to use something with a tighter pattern indoors. That said, I wouldn't hesitate to choose this ammo for defensive use inside a home, as long as I regularly practiced with it and knew its characteristics. Nice on recoil and tight enough pattern for home defense range. Not much to say about 12Ga. shotgun ammo except the Rio 00 Buck that I purchased was a good deal for what it is. I also purchased a SAW ammo can which was excellent to store the Rio in. I have not fired the Winchester 30-30 that I bought but I am sure it will do well. All in all, my experience with Luckygunner.com has been very good up until now. ALWAYS REMEMBER, TREAT EVERY GUN LIKES IT'S LOADED AND SAFETY FIRST ABOVE ALL!! Ammo works great and cycles fine in my mossberg 500. Great service and quick shipping from lucky gunner. great performing ammo, good price! Took my 870 pump out to try and determine the effective range of this low recoil 00 buck. It cycled poorly even though I slammed back the action. Winchester and Federal worked fine with no hick-ups. Would not trust this ammo farther than 25 yrds. Also not happy with the delivery time from the date I placed the order till when I received it which was 8 days. Great product at a very good price. As usual, great service from Lucky Gunner. Have recommended Lucky Gunner to several family and friends. My wife likes to shoot, but I get tired of picking her up every time she fires my shotgun. It's boom and then pick her back up, boom and pick her back up. But now with this low recoil shot she is handling the weapon just fine and her accuracy has improved. I think that's good? Good to go! Great Ammo! Great price. Will be my go-to ammo. first time buying from lucky gunner. great customer service. Awesome delivery time by Lucky Gunner and the product performs on par with more expensive ammo--I love it. On time delivery no problems no hassle. This is the first and only place I bulk order value and quantity insure I have lots of range time without breaking the bank . 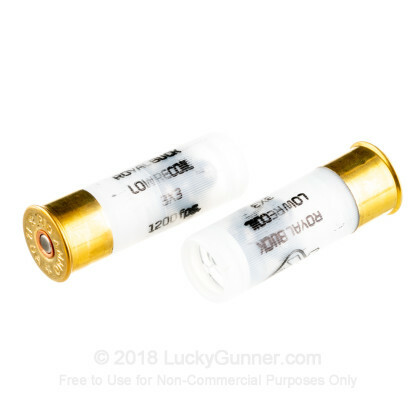 Lucky Gunner stocks a large variety of ammo and the live inventory makes shopping here a guarantee your product will be delivered. I am positive this ammo will be completely compatible with my tatical 870. The price was so low for low recoil "00" I was skeptical. Pretty clean, recoil was pretty low, the price was amazing. I plan on purchasing more. Thanks LG for great prices and fast shipping. I put close to 200 rds (in about a 4 day period) of this thru my Benelli Super Nova without a single issue. Patterns well and recoil is noticeably less than my standard 00 buck defense rounds. The range I shoot at only allows the Low Recoil 12ga ammo. I did a lot of research on the Low Recoil ammo and I was surprised to find the prices so high (even at the gun show). I shot the Low Recoil Remington Ammo from the shop at the range and this ammo seems to be of better quality. My buddies who shot it with me, said the recoil was noticably more, but I honestly didn't feel it. It was extremly pleasant to shoot and the clear plastic shells appear extremely clean and of high quality. 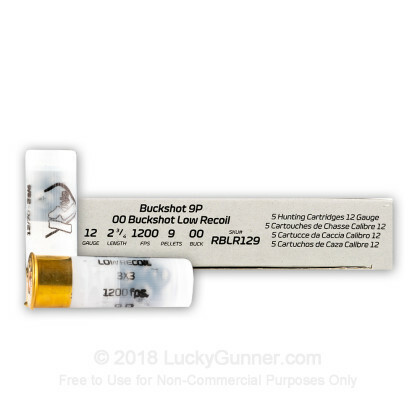 I was impressed considering after shipping I paid more than 40% less than any other 12ga 00 Low Recoil Buckshot I could find. I shoot a Remington 870 Tactical with a Knoxx SpecOps Pistol Grip Recoil absorbing stock. With these shells and that setup you can shoot all day without feeling a thing. It is so much fun to shoot.